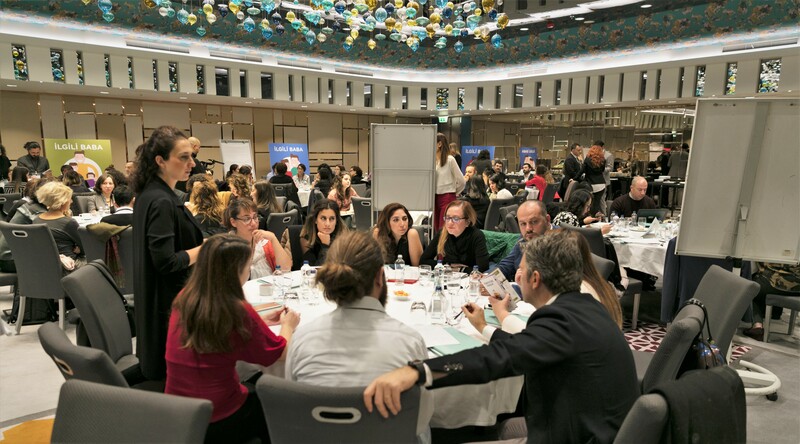 "Approaching men over fatherhood is the most important key to succeed in gender equality"
30 November 2017, Istanbul – Mother Child Education Foundation (AÇEV), with the partnership of United Nations Population Fund (UNFPA) Turkey Office, held a meeting titled as "AÇEV is discussing ‘Involved Fatherhood’ with Private Sector" to ask private sector representatives to promote involved fatherhood and support fathers in the work places. The purpose of this discussion meeting is to create an environment for private sector representatives to assume a leading role in gender equality by emphasizing the importance of family friendly approach and ensuring that fathers assume equal responsibilities for childrearing. The aim of the Mother and Child Education Foundation (AÇEV) is to embed the ‘involved father' concept into the private sector's human resource policies as well as to its services and extend this understanding even to its suppliers; based on the expectations that these new policies can pave the way for a major change that will set an example for fathers to assume more responsibility in child care. "What role do companies play in spreading the concept of fatherhood? ", "What can we do to spread the practices and changes in this area both in our own world and in our societies?". The representatives of many companies came together in the meeting where the questions were opened for discussion for "involved fatherhood". BUnited Nations Population Fund (UNFPA) Gender Equality Program Coordinator Meltem Ağduk, mentioned in her preamble that, at the beginning of the year 2000, the inclusion of men in gender equality work was gradually being seen, and as the United Nations Population Fund Turkey office in the same year we started working with men to achieve gender equality. 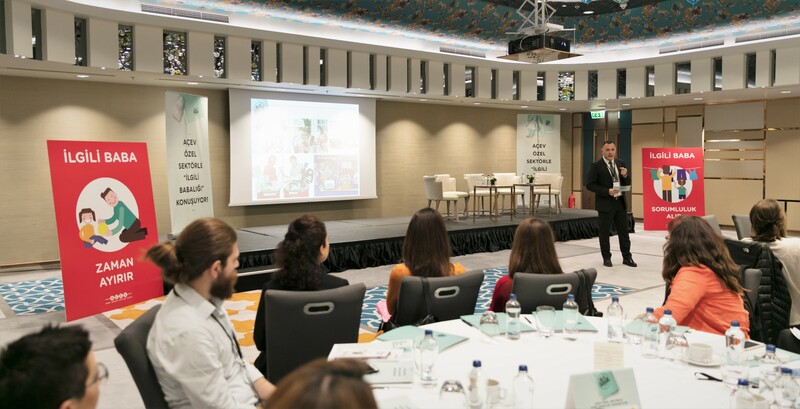 Ağduk emphasized that in the gender equality work they have done with public and private institutions, they experienced difficulties in reaching men and that this problem could only be achieved when men started talking about their children, especially their daughters. Ağduk, in her speech, "when the subject came to their daughters, the fathers listened to what we had to say much more attentively. We have now discovered that we have not given examples over their mothers or spouses. We understood that when we talked directly to men about the gender equality issues, the messages did not reach them, it was necessary to use an instrument to bridge the gap... That instrument was turned out to be their daughters. The most important key to achieve gender equality is to reach men over their fatherhood roles". In his speech titled as "Starting a conversation", Hasan Deniz, Director of Family Education Department of AÇEV, said, "It is necessary to support fathers in the work environment. Fathers are men who do not really know how to be a father. They try to act like their own father. They also base their male definitions on films or in TV commercials but they do not know how to be a father exactly. Today, the interest of representatives of private sector participating in this meeting makes us very happy. I believe we can pull off a gender equality transition together." After the speeches, panel members took the stage to discuss their own fatherhood experiences. 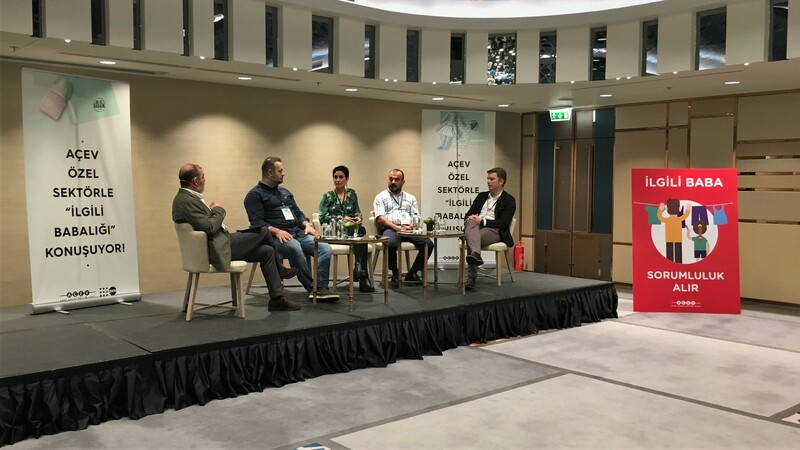 In the panel, Ali Taylan Çulpan, also known as "Flying Dad", Elif Doğan, known as "Blogger Mother", Rifat Dağlı, who completed the ‘involved father’ certificate program of AÇEV, and Safak Tankurt from Açelik-LG, discussed about their struggles, observations and best practices. "Flying Dad" blogger Ali Taylan Çulpan said that men were still hesitant to take advice on fatherhood. Çulpan added that theses fathers got in touch with him regarding childrearing tips not by posting a question on the blog’s public discussion board, but with a private message so that no one can see that that particular father is asking a question. Çulpan said that there a lot of fathers who gave equal time and labor with their wifes when raising children, but that they keep their identity hidden due to the "male-peer pressure", and underlined that the same understanding and flexibility shown to mothers should also be shown to the fathers in the workplaces when it comes to executing fatherly responsibilities. "Blogger Mother" Elif Doğan said repeatedly in her writings that motherhood was often not "rose pink" and that "impeccable motherhood" pressure on the mothers was an artificial and unfair approach. She expressed that the fathers shall shift from supportive individuals to be "fully involved fathers" who assume equal responsibilities. Rifat Dağlı, who received “Involved Father certificate” from AÇEV, said that fatherhood is a subject that we learned only by observing our own fathers. He said that thanks to AÇEV’s training, he turned into a father who enjoys spending time with his child, have conversations with his child, and even changes his life according to the responsibilities that being a father requires to take. Now, as an employer himself, Dağlı added that he is more understanding and supportive to fathers working in his company. Şafak Tankurt from Arcelik-LG, who handed out his assembly line to women, said that they have broken the prejudices of the men working in the factory who before thought that "women cannot do this job". To show that women are technically as capable as men, they designated the whole production line completely to women workers. 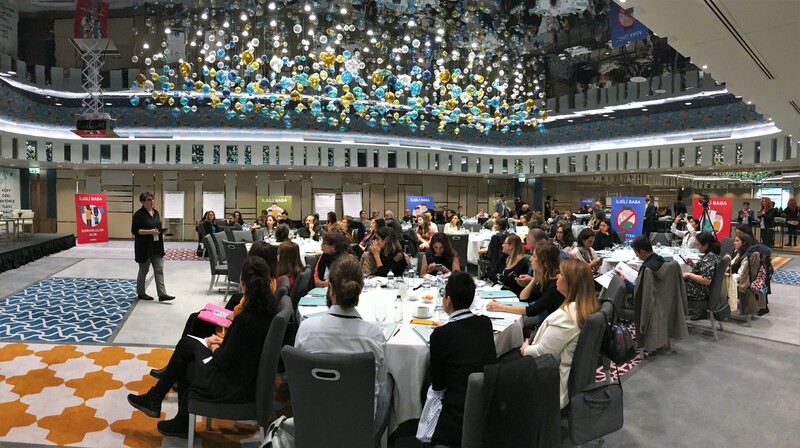 Tankurt said that they had tackled preliminary judgments in their own right to tear down the gender inequality barriers in the private sector, and underlined the difficulties of not having “the best case scenarios” in front of them. He emphasized that ensuring gender equality in the workplace is not based on having the same number of male and female employees, but to create a suitable work environment for both groups. The meeting "AÇEV is discussing ‘Involved Fatherhood’ with Private Sector" ended with a group exercise attended by company representatives. In the exercise, participants agreed on the idea of making improvements at workplaces to encourage men to be more involved fathers. When mothers want to leave their children to school and take them to a doctor, they can easily get permission; the same should be applicable to fathers as well. Discussions were held on the possibility that, new fathers may get assistance from senior fathers on "involved fatherhood". Some also suggested that new HR policies should be developed to support and to provide guidance for new fathers in work places.